Investing in new countertops is a large decision. We would like to give you 5 tips to ease this process. We know that the process of picking out countertops can be a very tidious and question filled one, so we recommend, make a list with any questions, conerns, or hesitations you might have. Our pro staff are more than happy to share their experiences and knowledge with you clearing up any misconceptions you might have with granite as a countertop material. When you stop by one of our over 20 locations the staff are there to help guide you through the twists and turns of buying countertops. Having this list of questions in hand will help ensure that you get the perfect stone selected for your particular project. If you have the question racing around your mind about how to proctect your new investment... Take a look at our Guaranteed Granite & Marble Sealer that is warrantied for 25 years! Truly, this is best investment you can make to protect your new granite countertops. 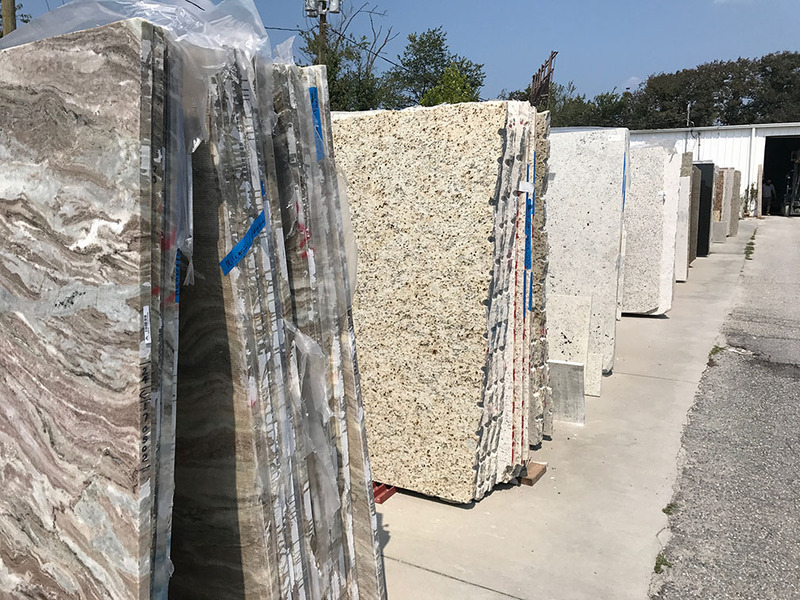 Although picking that perfect color for your granite countertop is a hurdle, our inventory can help! Since we have 1000's of slabs in our inventory, there are a mulitude of choices to choose from. You can see the whole slab your countertop will come from not just a small square sample or a sample slab on display. You see your exact slab before the manufacturing process begins and you will always know exactly what you are getting. If you are completely remodeling your kitchen we have samples of our cabinet and tile offerings if you are in the market for those as well! If you are only updating your countertops it will be beneficial to your search to have items that are currently part of your kitchen, such as a cabinet door, tile sample and drawer pull. This will help you find the perfect stone choice to match your existing kitchen elements. The edge profile is the perfect finishing touch to tie your kitchen together. Do you have modern cabinets? If you do, a bullnose or an eased edge profile would compliment your modern cabinet design. These edges are also great if you have small children running around your home as this edge removes any sharp corners or hard edges. If your kitchen's style is more of a traditional style our bevel or ogee edge profile would be the perfect fit. If possible, when you visit one of our showrooms bring in a photo of your kitchen and our pro staff can help you decide on the best edge profile for your project. In the industry we refer to the vein/pattern as Movement in the stone. When choosing the perfect stone for your new countertops keep in mind the size and layout of your cabinets. If you choose a stone with a larger vein/pattern or movement and your cabinets have a lot of angles and corners, it will be more difficult to make the seams align properly. Always remember that the larger the movement in the granite, the harder it is to keep cohesive through the layout. If you are ready to start the process of updating your countertops or renovating your kitchen/bathroom, please click the "Free Estimate" button (the big yellow one on the right hand side of the screen), click the Free Quote button below, give us a call, or stop by one of our over 20 locations and speak to one of our pros today!